THIS BOOK IS A GALLOPING ADVENTURE STORY, a sort of spiritual Raiders of the Lost Ark, but it's also an accurate description of spiritual experience and a summary of important spiritual teachings. It was a tremendous best-seller in many countries in the 1930s and 40s, appealing to the general public and not just spiritually-oriented people. The author, a young Englishman, tells the true story of his adventures travelling up and down India looking for a genuine guru. His search ends when he finds Ramana Maharshi. This is the book that made Ramana Maharshi famous outside India. Brunton’s description of Ramana’s teachings is still useful and accurate today. This book is much better written than most spiritual books — it was a general best-seller, not just a spiritual best seller — and it’s a lot of fun to read. WORD IS BROUGHT ME ONE DAY concerning a reputed Yogi. He lives about half a mile outside Madras, yet, because he discourages acquaintance, appears to be known to few persons. My curiosity is quickly excited and I determine to have an audience with him. This story is reprinted from A Search in Secret India. The house is hidden behind tall bamboo poles which fence a square compound, and which stands completely isolated in the centre of a field. My companion points to the compound. A rough gate gives entrance to the enclosure, but as it is strongly padlocked I begin to wonder how we are to get into the house. Complete silence pervades the scene. We wander around the field, turn away from a piece of adjoining waste land, and eventually meet a boy who knows where to find the residence of the Yogi’s attendant. A circuitous walk brings us to the place. The man proves to be a hired servant. His wife and many children come outside to see us and trail behind his heels. We tell him our desire, but he refuses to help us. He firmly declares that the Sage Who Never Speaks is not on view to stray visitors, but lives in strict seclusion. The Sage’s days are spent in deep trances and he would be highly offended if all and sundry were allowed to break in on his privacy. I beg the attendant to make an exception in my favour, but he is adamant. It becomes necessary for my friend to threaten Government interference, if we are not admitted forthwith — a totally unjustifiable procedure, of course, but one which I illegally reinforce, though our eyes wink towards each other. There ensues an animated discussion. I supplement our threats by the lure of liberal baksheesh and it is not long before the attendant reluctantly yields and brings out his keys. My companion informs me that it is clear the man is no more than a paid servant, because if he were a personal disciple of the Sage, neither threats nor money could have moved him. We march back to the gate of the compound and unlock a massive iron padlock. The servant informs us that the Sage’s belongings are so few that they do not include a key. He is locked in the compound from the outside and has no means of egress until the attendant’s visits, which take place twice daily. We learn further that the Sage is occupied with his trances throughout the day, but in the evening he partakes of some fruit, sweetmeats, and a cupful of milk. There have been many evenings, however, when the food has remained untouched. The fall of darkness sometimes brings the recluse out of his cottage, though a walk around the fields is the only exercise he takes. We cross the compound and arrive at a modern cottage. It is solidly built of stone slabs and painted timber posts. The attendant produces another key and unlocks a heavy door. I express surprise at all these precautions, for did not the servant tell us that the Sage’s belongings are very few? Thereupon the man tells us a brief explanatory story. Some years earlier the silent Sage lived in the cottage without the protection of any locks or fastenings upon the entrances. But one unfortunate day there came a man who was drunk with toddy liquor, and who took advantage of the defenceless state of the Sage to attack him. The drunkard pulled his beard, belaboured him with a stick and shouted disgusting epithets. Chance intervened to draw some young men into the field, intent upon playing a ball game. The noise of the assault drew their attention. They entered the cottage and rescued the Sage from his assailant, while one of them ran off to the nearest houses to inform all and sundry. Before long a group of excited people gathered together, Indian fashion, and began to mishandle the drunken ruffian who had dared attack a revered holy man. There was a likelihood that the man who was so dastardly would be lynched. Throughout this episode the Sage had maintained his usual stoic calmness and endurance. Now he intervened and wrote down the following message. Since the Sage’s word was unwritten law, his request was unwillingly obeyed and the miscreant set free. The attendant peers into the room and then warns us to be perfectly quiet, because the Sage is sunk in trance. I unlace my shoes and leave them behind on the veranda, in obedience to the inexorable dictates of Hindu custom. As I bend my head I notice a small flat stone in the wall. Its face is inscribed with Tamil characters. “The Abode of the Sage Who Never Speaks,” translates my companion. We enter the one-roomed cottage. It is lofty, well-roofed and scrupulously clean. A raised marble dais, which is about one foot high, is built into the floor’s centre. Its surface is covered with a richly patterned Persian rug. Upon this rug sits the entranced figure of the silent Sage. Imagine a handsome man, whose skin shines with a tawny blackish colour, whose body is finely erect, and who sits in a peculiar attitude which I immediately identify as one of the Yoga postures which Brama has shown me. The left leg is doubled back so that the foot is under the base of the body, and the right leg is swung across the left thigh. The Sage’s back, neck and head form a perfectly straight line. His hair falls in long black strands almost to his shoulders, and hangs thickly around his head. There is a sweeping black beard upon his chin. His hands are clasped over his knees. I notice that the trunk is remarkably well developed; it is very muscular and he is clearly in a healthy condition. The only covering he wears is a loin cloth. His face photographs itself immediately in my memory as the face of a man who smiles in triumph over life, a man who has conquered the frailties which we, feebler mortals that we are, harbour willingly or unwillingly. The mouth is slightly stretched — as though about to break into a smile. The nose is short and straight, almost Grecian in type. The eyes are wide open; they stare straight ahead in a fixed and unblinking gaze. The man sits like a carved rock and never moves. My informant has earlier told me that the silent Sage is without doubt deeply immersed in an entranced communion wherein the human part of his nature is presumed to be sunk into temporary abeyance, and that he is quite unaware of his physical surroundings. I watch the Sage steadily but can find no room for doubt that he is in a cataleptic trance. The minutes add up into hours but he remains motionless. What impresses me most is that throughout that time he never blinks his eyes. I have never before met any human being who could sit down and look steadily ahead for two hours without the flicker of an eyelid. Little by little, I am compelled to conclude that if the recluse’s eyes are still open, they are nevertheless quite unseeing. If his mind is awake, it is not to this sublunary world. The bodily faculties seem to have gone to sleep. Occasionally, a tear drop falls from his eyes. It is clear that the fixation of the eyelids prevents them carrying out their usual office on behalf of the tear ducts. A green lizard descends from the roof, creeps across the carpet, crawls over one of the Sage’s legs, and then passes behind the marble dais. Yet, had it crawled over a stone wall, it would not have found a steadier surface than that leg. From time to time flies settle upon his face and journey over his swarthy skin, but no muscular response can be observed. Had they alighted upon the face of a bronze statue, precisely the same effect might be observed. I study the figure’s breathing. It is extremely gentle, almost imperceptible, quite inaudible but quite regular. It is the only sign he provides that life has not parted from the body. While we are waiting I decide to use the time to take a photograph or two of this impressive figure. I slip my folding camera out of its leather case and focus the lens upon him from my seat on the floor. The lighting of the room is not good; therefore I give a couple of time exposures. I look at my watch. Two hours have passed. The Yogi still shows no signs of emerging from his long trance. The sculptural rigidity of his form is remarkable. I am prepared to stay all day in order to achieve my object, in order to interview this strange man. But the attendant now comes up to us and whispers that it is useless to wait any longer. Nothing will be gained by doing so. If we will come again in a day or two, better fortune might be ours; nevertheless, he cannot promise anything definitely. We leave the place, temporarily defeated as we are, and turn our steps toward the city. My interest has not waned; on the contrary, it has heightened. During the next two days I endeavour to collect some information relative to the Sage Who Never Speaks. This endeavour involves a scattered and discursive investigation, which varies from a lengthy cross-examination of his attendant to a brief interview with a police inspector. In this way I succeed in piecing together a fragment of the Sage’s story. Eight years ago he arrived in Madras district. No one knew who he was, what he was or whence he came. He took up his residence on the piece of waste land which now adjoins the field containing his cottage. Inquisitive inquirers who addressed him received no reply for their pains. He spoke to none, heeded no sounds and no persons, and could not be drawn even into the most casual conversation. He begged a little food occasionally by holding out his coconut-shell bowl. Day after day he persisted in squatting amid these unattractive surroundings, despite his exposure to the relentless rays of a burning sun, to the heavy downpours of the monsoon season, and to dust and unpleasant insects. Never at any time did he make any effort to seek shelter, but always remained serenely oblivious of external circumstances. There was no protection for his head and no covering for his body, except for a narrow loin cloth. He never changed the Yoga posture in which he sat for any other. Now, the outskirts of a large city like Madras were hardly suitable for a hermit who wished to seat himself in the open air and in full public gaze in order to plunge his mind into abstracted meditations for lengthy periods. Such conduct would have won great respect in ancient India, but the modern Yogi can find favourable conditions for his mystic practices only in sparse jungle spaces, forest retreats, mountain caves or in the seclusion of his room. Why, then, did this strange hermit choose such an unsuitable spot for his meditations? An unpleasant occurrence provided the curious explanation. One day a band of youthful and ignorant hooligans came across the lonely Yogi by chance and began to persecute him. They left the city with reprehensible punctuality to engage in a daily campaign of stone-throwing, dirt-flinging and abusive jeering. The hermit continued to sit quietly, and patiently endured his trials, although he was stalwart enough to be able to give them a sound thrashing. He did not even rebuke them because he was under a vow of silence. Nothing stopped the young brutes until a man happened to pass by when they were busy with their usual persecution of the Yogi. The stranger was shocked at seeing a holy man so ill- treated. He went back to Madras and gave information to the police, from whom he demanded help on behalf of the voiceless Yogi. The help was forthcoming and the despicable band was dispersed with severe warnings. The police officer was quite satisfied that the man was a genuine faqueer of a superior type, so he withdrew after promising protection against the hooligans. He recognized the name of Marakayar as being that of a famous Muhammedan faqueer who had recently died. “Out of evil cometh good,” runs the old proverb. The upshot of this unpleasant affair was that the presence of the recluse became known to a wealthy and pious citizen of Madras. The latter endeavoured to tempt him into the city with the lure of residence in a fine house, but the hermit would not disobey his master’s instructions. In the end the newly-found patron had to build a stone-and-timber bungalow near the ground which the Yogi refused to leave. The latter consented to occupy it and, as it was properly roofed, he was thenceforth adequately protected against the inclemencies of changing seasons. His patron also appointed a personal attendant for the Yogi. It was now no longer necessary for the latter to beg, as all his food was brought to him by the attendant. Whether his master Marakayar had foreseen such a pleasant consequence of an unpleasant experience or not, it remained that the last condition of his pupil was much better than the first. I learn that the Sage Who Never Speaks has not even one pupil. He seeks none and accepts none. He is one of those solitaries who prefer to live in isolation in order to achieve their own “spiritual liberation.” If there is any value in the latter, then their attitude is apparently a selfish one, judged by our Western lights. And yet, when one remembers the Sage’s profound considerateness towards the drunkard and his refusal to retaliate against the young hooligans, one wonders whether he can be so very selfish after all. Accompanied by two other persons, I make my second attempt to interview the Sage Who Never Speaks. One is my interpreter, while the second man is none other than the Yogi who has taught me so much — Brama, “the Adyar anchorite,” as I affectionately call him. Brama never cares to enter the city, but when I make known the object of my visit and desire him to accompany me, he agrees without demur. At the compound we meet another visitor, who has left a large car on the roadside and walked across the fields to the same objective. He, too, is desirous of seeing the silent Sage. He tells me during a brief conversation that he is a brother of the Queen of Gadwal, a small state which is tributary to the Nizam of Hyderabad. He informs me that he also is a patron of the Sage, inasmuch as he insists on making a regular contribution towards the cost of maintaining the shelter. He has come on a brief visit to Madras, but cannot leave the town without paying his respects to the Sage, and perchance receiving his blessing. What the latter is worth, I learn from a story which the visitor narrates. A lady at the Court of Gadwal had a child who suffered from some dread ailment. By some odd coincidence she heard of the existence of the Sage Who Never Speaks. Such is her anxiety that she journeys to Madras and begs the hermit to grant his blessing and heal the little boy. The blessing is given and from that date the child makes a marvellous recovery. The incident comes to the notice of the Queen, who also visits the hermit. Her Highness presents him with a purse of six hundred rupees, which he refuses to accept. She presses him until he writes a message saying that the money can be used to improve his shelter by fixing a fence around the cottage, so that he shall secure more privacy. The Queen arranges to have this done and thus the bamboo fence comes into being. The attendant again admits us into the cottage, where we find the recluse sunk in the same trance-like condition which he maintained throughout my first visit. We squat upon the floor in silence and wait patiently before the tall, majestic, black-bearded figure on the marble dais. About half-way through the second hour we perceive the first signs of returning activity in the Sage’s body. His breathing becomes deeper and then more audible. The eyelids move, the eyeballs roll alarmingly upwards until the whites glare and then come down to normal. A slight swaying movement becomes perceptible in his trunk. Five minutes later the expression in the Sage’s eyes changes in such a way that we know he has become aware of his physical environment. He looks attentively at the interpreter, turns his head abruptly and looks at Brama and then at the other visitor, turns it again and looks at me. I am compelled to admit to this activity. As a matter of fact, the effort had been useless, for I had under-exposed the films. It is evidently looked upon as a minor act of sacrilege to penetrate the solitude of such a man, so I express my regrets. The Queen of Gadwal’s brother now proffers his devotion to the Sage. 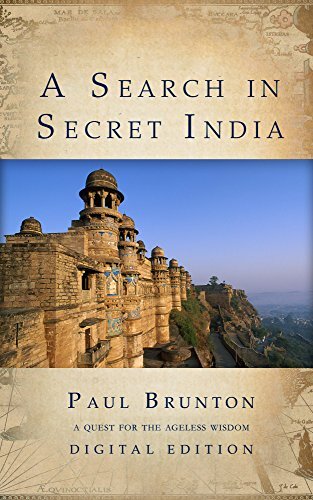 When he has finished I venture to introduce myself as one deeply interested in the ancient wisdom of India. I have heard across the seas, I inform him, that India still possesses a few men who have made remarkable attainments in Yoga and I seek to discover them. Will the Sage give me such enlightenment as he thinks fit? The hermit remains statuesque, impassive; his face betrays no responsive change of expression. For fully ten minutes he gives no sign that he has heard my request. I begin to fear that I have drawn a blank, that he regards the materialistic Westerner as unfit even for the slightest degree of enlightenment. Possibly my clumsy outrage with the camera has repelled him. Am I not expecting too much, when I expect this reserved member of a reclusive species to break his trance for the sake of an infidel member of an alien race? A sense of chagrin rises up in me. My disappointment is too premature. The Sage takes the pencil at length and scrawls something upon the paper. When he has finished I lean over and push the pad to our interpreter. “What is there to understand?” he slowly translates. The writing is difficult to decipher. “The universe is full of problems?” I rejoin, disconcerted. I fancy that a slightly derisive smile now begins to play around the lips of the Sage. He looks straight into my eyes. I feel that behind his steady gaze there is some deep knowledge, some store of secrets which he is guarding with relentless care. I cannot account for this queer impression. “Yet I am much bewildered,” is all I can bring myself to say next. This answer tantalizes me. It is, no doubt, all-sufficient to an Oriental mind. Its mystic vagueness charms me as a piece of poetry, but blurs me when I look for a useful contribution that will solve some of life’s problems. “Seek your own self, and you shall know the Truth which is deep hidden therein,” comes the reply. “But I find only the emptiness of ignorance,” I persist. “The ignorance exists within your thoughts alone,” he writes laconically. A very dim light begins to dawn on me. I feel that, given sufficient time in which to meditate on the matter, we shall be able to understand each other; therefore, I resolve not to press the point too much. I turn my head and look at the intruder. He is a man not older than forty, dressed in the ochre coloured robe of a wandering Yogi. The skin of his face shines like polished brass. He is well built and broad shouldered — a powerful looking figure. His nose is thin, prominent and beaked like a parrot’s. His eyes are small and seem to be wrinkled in perpetual laughter. He squats upon his haunches and grins broadly at me when our eyes meet. Another question comes to the forefront of my mind. It is possibly too daring or too impertinent. A quizzical expression crosses the calm face of the hermit. I make a last attempt to draw him. He then informs us that he wishes to close the interview, so as to resume his trance. I ask for a final message. I hardly finish taking in the purport of his answer when I suddenly feel a strange force entering my body. It pours through my spinal column and stiffens the neck and draws up the head. The power of will seems raised to a superlative degree. I become conscious of a dynamic urge to conquer myself and make the body obey the will to realize one’s deepest ideals. And I feel intuitively that those ideals are but voices of my best self, which alone can promise me lasting happiness. A queer thought comes to me that some current is being projected to me from the Sage, some invisible telepathic current. Can it be that he is thus vouchsafing to me an inkling of his own attainment? The eyes of the recluse become fixed and the far-off look again enters them. His body becomes taut as he settles down more firmly into his familiar posture. I plainly perceive that he is withdrawing his attention into depths which may possibly be deeper than thought, that he is plunging his consciousness into inner recesses which he loves better than this world. Is he then a true Yogi? Is he engaged on mysterious inward explorations which, I begin to suspect, may be fraught with some meaning to humanity? Who knows? We proceed in silence across the fields and then rejoin the dusty road. I do not mention to anyone the unexpected and inexplicable experience which came to me in the cottage. I want to muse over it while its echoes are yet sounding fresh within me. I never see the Sage again. He does not wish me to intrude upon his secluded life and I must respect his wish. I leave him to his lonely meditations, wrapped in his mantle of impenetrability. He has no desire to found a school or collect a following, and his ambitions seem to stretch no farther than passing unobtrusively through life. He has nothing to add to what he has already said to me. He does not make an art of conversation for its own sake, as we do in the West. This page was published on May 11, 2017.